Walt Disney Pictures is taking a big risk this weekend. Well, actually, the risk was taken awhile back and now it’s time to see if Prince of Persia: The Sands of Time can pay off. When Disney and Jerry Bruckheimer realized it would be quite some time before another Pirates of the Caribbean film would be able to come together, they began looking for solutions. Interestingly enough, they zeroed in on a video game, Prince of Persia, a title that’s been around since 1989, managing to find life on the 3-D gaming platform, first on Sega Dreamcast and then on Play Station 2 and 3 thanks to Ubisoft. Seeing as video game adaptations have been cursed for ages as nothing more than cult hits for a segment of the male population, the risk by Disney of all people to bring the first fantasy/adventure game (one not involving sci-fi, fighting or guns) is tremendous. How they expected to replace the action/wit combination provided by Jack Sparrow with the mysterious prince was probably beyond anybody at the time news first broke of the rights being optioned. In the last six months, Disney has had the challenge of marketing this PG-13 title to pre-teens and teens and families who might not find Persian assassins and the costume and set trappings of the Middle East nearly as interesting or likable as Pirates. I was walking through Target the other day when I saw one such promotion: LEGOs. As a huge LEGO fan and former employee (yes, I worked at the LEGO Store the summer after graduating high school), I wasn’t surprised. Ever since LEGO and Star Wars tried cross-promotion and that skyrocketed and then Harry Potter joined in, it only made sense that Disney (who has a LEGO Store in Downtown Disney in Orlando) finally do the same. There’s no better way on the planet to reach kids ages 7-14. On Disney’s movie site for “Sands of Time,” there are a number of books for a number of ages, all appeared to be branded with the modern type face being used on the movie posters. 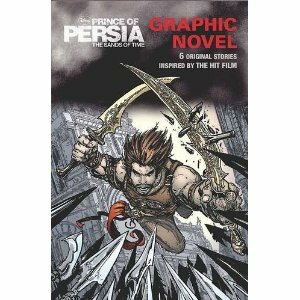 A graphic novel, a title “Chronicle of Young Dastan” and others found their way to shelves this past year as books for pre-teens generally translate to cash. I’m sure other examples of Disney’s attempts exist too, but nothing changes that from the get-go this would be an uphill battle. Then again, if a dinky theme park ride can be turned into a gold mine on the big screen, what stops anything with a good story and memorable characters? Studios just like there to be some previous attachment (a video game, board game, toy line, theme park ride) and then as long as they take full creative reign of the story, there’s no reason it has to be bad. The trouble is the long-running video game stigma. Although I did mention that this is the first truly big-budget adaptation of a game that doesn’t involving shooting people, it’s still attached. I think the reason is because there is a back story and plot to keep in mind, you can’t just invent everything on your own. Plus there is some fan-base loyalty to keep in mind. Too often these game adaptations have lackluster fun-only plots without much character development. Games don’t usually have a core message either (other than “hooray, you saved the ____ !”), they’re purely intended for entertainment, so you have to create one or it’s not there. Now onto the money issue. I believe Tomb Raider still stands as the highest-grossing video game adaptation of all time. It made $47 million its opening weekend (that’s pretty good all things considered) and made $274 million worldwide. Considering this film probably cost near $200 million to make and even more to promote, Disney needs that at minimum. It will probably need a lot of help from the worldwide box office to do so, seeing as that’s how Robin Hood, another period-dress action movie with a PG-13 rating is getting it done. The coveted Memorial Day release will also help, but will it be enough? Early so-so reviews are not boding well, but that doesn’t mean there’s no hope for a decent pull.